Not to be confused with Strain (injury). A sprain, also known as a torn ligament, is damage to one or more ligaments in a joint, often caused by trauma or the joint being taken beyond its functional range of motion. The severity of sprain ranges from a minor injury which resolves in a few days to a major rupture of one or more ligaments requiring surgical fixation and a period of immobilization. Sprains can occur in any joint but are most common in the ankle and wrist. 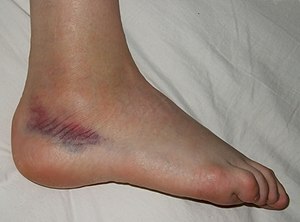 A sprained ankle with bruising. Sprains typically occur when the joint is taken beyond its functional range of motion. There are certain factors which increase risk of sprains. Fatigue of muscles generally leads to sprains. When one suddenly starts to exercise after a sedentary lifestyle, sprains are quite common. While scientific studies are lacking, it is often thought that not 'warming up' is a common cause of sprains in athletes. 'Warming up' is thought to loosen the joint, increasing blood flow and making the joint more flexible. A diagnosis of a sprain can often be made with a good degree of certainty by physical examination based on the clinical presentation and method of injury. In some cases, X-rays are obtained to ensure that there is no fracture. In some cases, particularly if the injury is prolonged or does not appear to be resolving as expected, magnetic resonance imaging (MRI) is performed to look at surrounding soft tissues and the ligament. First degree sprain (mild) – the fibres of the ligament are stretched but intact. Second degree sprain (moderate) – is a tear of part of a ligament, from a third to almost all its fibres. Third degree sprain (severe)– is a complete rupture of the ligament, sometimes avulsing a piece of bone. The ankle. It is the most common, and has been said that sprains such as serious ankle sprains are more painful and take longer to heal than actually breaking the bones in that area. See sprained ankle for more details. The knee. One of the more talked about sprains is that to the anterior cruciate ligament (ACL) of the knee. This is a disabling sprain common to athletes, especially in American football, football (soccer), basketball, pole vaulting, softball, baseball and some styles of martial arts. See Anterior cruciate ligament injury. The first modality for a sprain can be remembered using the acronym RICE. The treatment of sprains depends on the extent of injury and the joint involved. Medications like non-steroidal anti-inflammatory drugs can relieve pain. Topical NSAIDs appear to be as good as those taken by mouth. Research suggest PRICE, as a way of managing an ankle sprain. Protect: It is important to protect the injured site from repetitive injury. Rest: The sprain should be rested. No additional force should be applied on site of the sprain. In case of, for example, a sprained ankle, walking should be kept to a minimum. Compression: Dressings, bandages, or ace-wraps should be used to immobilize the sprain and provide support. When wrapping the injury, more pressure should be applied at the far end of the injury and decrease in the direction of the heart; the reason for this is that it more easily causes unnecessary fluid to be flushed back up the blood stream in order to be recycled. Compression should not cut off the circulation of the limb. Elevation: Keeping the sprained joint elevated (in relation to the rest of the body) will also help minimize swelling. Non operative treatments including continuous passive motion (a machine that puts the joint through range of motion) combined with a cryocuff, which applies cold and compression, are successful in reducing swelling and improving range of motion. Strength and functional training that is implemented as soon as the edema subsides also aids in increasing range of motion of the joint. The joint should be exercised again fairly soon, in milder cases from 1 to 3 days after injury. Special exercises are sometimes needed in order to regain strength and help reduce the risk of ongoing problems. The joint may need to be supported by taping or bracing, helping protect it from re-injury. Prolonged immobilization delays the healing of a sprain, as it usually leads to muscle atrophy and weakness. Mobilizing the limb soon after a sprain has been shown to promote healing by stimulating growth factors in musculoskeletal tissues linked to cellular multiplication and matrix remodeling. The components of an effective rehabilitation program for all sprain injuries include increasing range of motion and progressive muscle strengthening exercise. Although prolonged immobilization can have a negative effect on recovery, recent studies suggest that the use of a brace can improve healing by alleviating pain. stabilize the injury, and prevent further damage to the ligament. When using a brace, it is very important to apply the correct amount of pressure, as too much can cause complications. ^ "Sprained Joints". Free Books. Retrieved 16 February 2010. ^ Shier D, Butler J, Lewis R (2007). Hole's Human Anatomy & Physiology (11th ed.). McGraw Hill / Irwin. pp. 157, 160. ISBN 978-0-07-330555-4. ^ Derry S, Moore RA, Gaskell H, McIntyre M, Wiffen PJ (June 2015). "Topical NSAIDs for acute musculoskeletal pain in adults". The Cochrane Database of Systematic Reviews. 6 (6): CD007402. doi:10.1002/14651858.CD007402.pub3. PMID 26068955. ^ a b Bleakley CM, O'Connor SR, Tully MA, Rocke LG, Macauley DC, Bradbury I, Keegan S, McDonough SM (May 2010). "Effect of accelerated rehabilitation on function after ankle sprain: randomised controlled trial". BMJ. 340 (may10 1): c1964. doi:10.1136/bmj.c1964. PMID 20457737. ^ a b c d "Sprained Ankle". American Orthopedic Foot and Ankle Society. March 2005. Retrieved 2008-04-01. ^ Cramer H, Ostermann T, Dobos G (February 2018). "Injuries and other adverse events associated with yoga practice: A systematic review of epidemiological studies". Journal of Science and Medicine in Sport. 21 (2): 147–154. doi:10.1016/j.jsams.2017.08.026. PMID 28958637. ^ a b Temponi EF, Saithna A, de Carvalho LH, Teixeira BP, Sonnery-Cottet B (January 2019). "Nonoperative Treatment for Partial Ruptures of the Lateral Collateral Ligament Occurring in Combination With Complete Ruptures of the Anterolateral Ligament: A Common Injury Pattern in Brazilian Jiu-Jitsu Athletes With Acute Knee Injury". Orthopaedic Journal of Sports Medicine. 7 (1): 2325967118822450. doi:10.1177/2325967118822450. PMC 6348520. PMID 30719481. ^ Keene D, Williams MA, Segar AH, Byrne C, Lamb S, et al. (Cochrane Bone, Joint and Muscle Trauma Group) (2016-02-25). "Immobilisation versus early ankle movement for treating acute lateral ankle ligament injuries in adults". Cochrane Database of Systematic Reviews. doi:10.1002/14651858.CD012101. Wikimedia Commons has media related to Sprains.